Thank you so much for posting fool-proof instructions, I *love* mandioca frita and will certainly try this at home! Vickie, great to “see” you around, what a nice surprise! Difícil explicar o que é mandioca frita…tão, tão maravilhosa! Adorei seu post! É uma delícia mesmo!!!! It´s hard to explain what it is…so wonderful! Loved the post! The flavor is great! We get a version of this called ‘mogo’ at our local south indian vegetarian deli/diner. The chef cooks it with garlic and chili. They come out looking a very desirable golden red. We are getting addicted to it! I will definitely be looking for a recipe for “mogo” – sounds fantastic! Sally what an interesting vegetable. I have not seen them around here. Would love to try it someday. for your information, mandioca can be turned into a delicious dessert. In New York, you could find this delicious home made dessert called: Cassablanca Cake in one of Asian supermarket in Queens, Top Line located at Broadway -Elmhurst, NY 11373.
mix all ingredients and bake it at 350 about 45 to one hour until it turns to brown color. Oh, that is too bad, Shabina! You know, it took me many years to find it where I live, but finally made it here! If you’re looking for it at Brazilian restaurants, try asking for Macaxeira. That’s what it’s called everywhere I’ve been in Brazil. 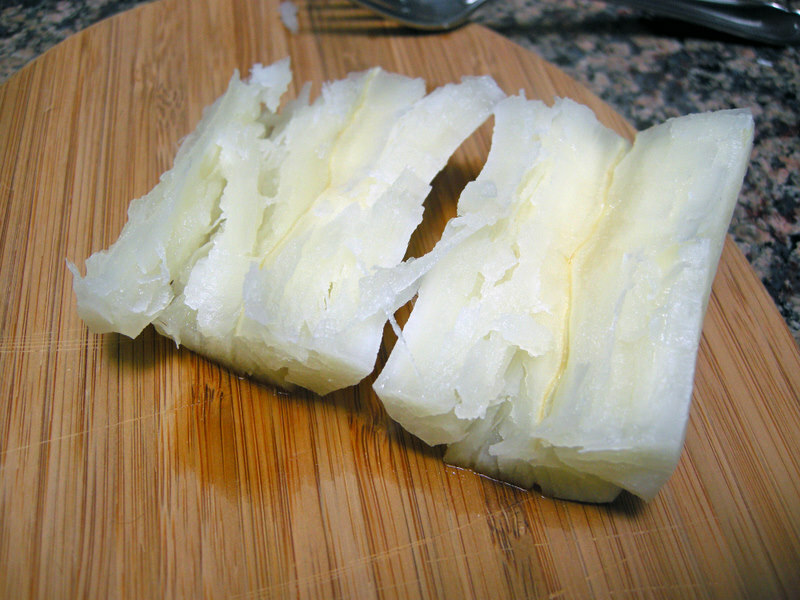 Also, try precooking it for 15 minutes in a pressure cooker then deep fat frying it. So much faster and I think better that way. Interesting that you brought up macaxeira, in Sao Paulo they normally do not use the term, but it is common in other regions of the country, particularly the Northwest. Maybe it is changing now, though – I think cooking terms that decades ago were unheard of in Sao Paulo and Rio are now more widespread. Loved the tip about pressure cooking! Should have thought about it! GENIUS! Are these okay to serve cold? I am going to make these for a project on food in South America. I will have to make them the night before they will be consumed. Are they okay to serve cold, or will a zap in the microwave do to heat them up? You could skip the frying, and serve them cooked (when they are tender, make sure no hard bits remain uncooked) – that is also a popular way to enjoy them back home, in some regions of Brazil that is a typical breakfast. In that case, you can cook them the day before, put in the fridge in a single layer. Next day, when you want to serve them, microwave them gently and serve with a little butter, not too cold, a bit on the softened side. As you serve them, spread with a little butter while they are still very hot, and sprinkle some salt on top. In that case they will be delicious next day too, but once you fry it, it’ s better to enjoy right away…. Feel free to contact me by email if you want…. I’m an American living in Brazil right now (teaching English for a year) and discovering these at restaurants on the beach was a dream come true! I’m so glad I have this recipe to make here and then take back with me when I return to the states. I also love making mashed mandioca, just like you would mashed potatoes but creamier and all around better! Obrigada, viu? Thanks so much for posting this! I lived in Brasil for 19 months and loved mandioca! I finally found some at a store that has things from all over the world and was so excited and as soon as I got home I realized I had no idea how to cook it straight from the root! I appreciate your help! Well this is also the same as we call it “mogo” this is available in most tropical countries. Most Indian Restaurants in UK have these if you refer to as “mogo” However there are several ways to make this mogo, we would prepare it the following ways. Firstly we would remove all the skin and then boil it, let it sit and cool down, take light oil with some salt, red chili pepper mix all and then roast it. This really would taste great with a beer. 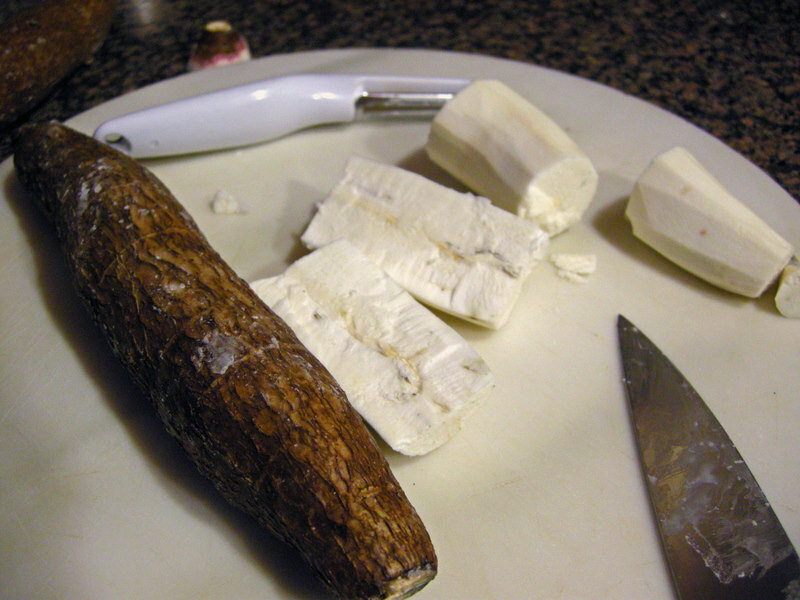 I will definitely search for some madioca root here in Los Angeles (I’ve seen it several times) and will be trying “mogo”. Stay tuned! Btw, for you guys living in the southern US, growing mandioca shouldn’t be very difficult as long as you can get your hands on a freshly CUT branch of the plant. Just stick it in the soil and it will grow and after about 1 year you will have tubers enough to feed you for another year. Mandioca is also strongly recommended for people with gluten sensitivity, because it’s gluten free. Ah and a word of caution: always ensure proper preparation of mandioca. 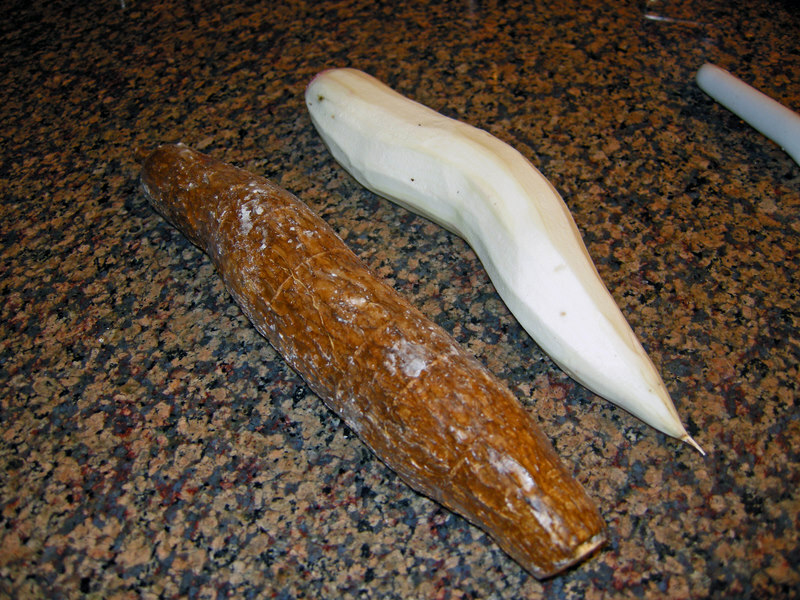 Raw tubers are highly toxic. Thank you!! I’m going to surprise my Brazilian husband at our Thanksgiving to feel a little less homesick. Very much appreciated! 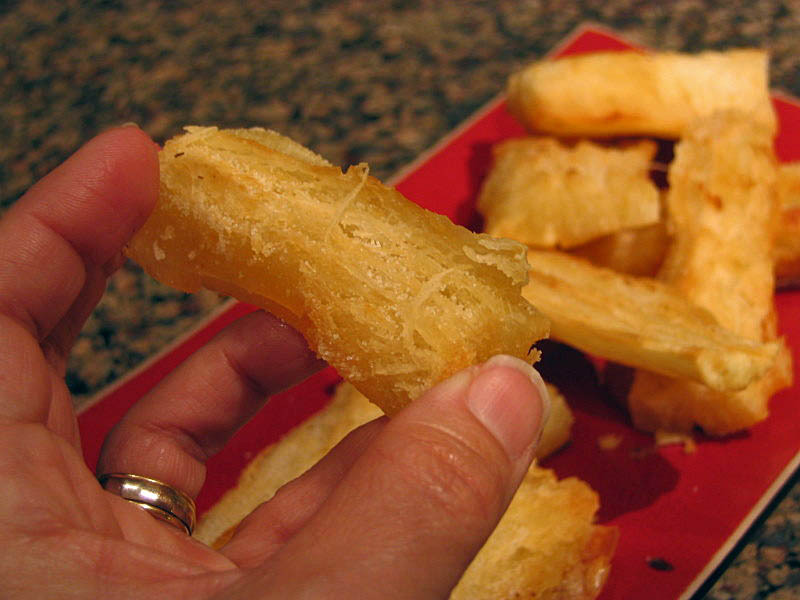 I googled a recipe for mandioca frita and found yours – it’s currently in progress as I write. I’m a Canadian who used to live in Recife, and I couldn’t get enough of the “macaxeira” frita, as they call it there. So excited to see how this turns out! Thanks so much for getting in touch! I remember having “macaxeira” early in the morning in Recife when I visited years ago – it was served for breakfast in THE most delicious preparation…. I had never had it that way, dreamy stuff! These have my stomach growling! Yummy. 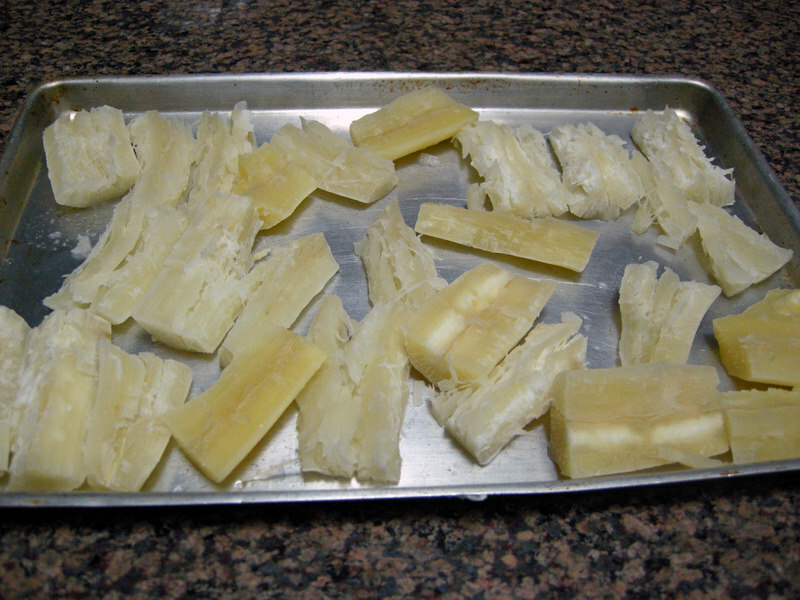 I didn’t know there were yellow manioc though… interesting! Hi, I can get frozen mandioca in Toronto – do I still have to boil it before frying??? I’m Braziliand and love mandioca. Recently, I found it at Walmart (frozen, brand Goya). To avoid frying, I just cook it and serve hot with a butter lemon sauce, cuban style. But today, I will try to fry. First cook and then, fry. Oh, I can’t wait for that. Um abraço!!!! Gostei do seu blog. Thanks a lot! I’m from Brazil and I’ve been dreaming (literally) about mandioca frita. Now I’ve sent my girlfriend instructions in English, we will prepare it together, later tonight. I have made a modification to this when frying (try it)…I add slab bacon chunks (3/4″ tp 1″) and when I make this, I can’t make enough to keep everyone happy it goes so fast!! So nice that I could help you make this at home! Your excitement reminded me of the first time my husband tried it in Brazil, many many years ago…. it was so nice to see him wolfing down some mandioca frita and going on and on about how great it was! I’m an American living in Brazil right now (teaching English for a year) and dioeivcrsng these at restaurants on the beach was a dream come true! I’m so glad I have this recipe to make here and then take back with me when I return to the states. I also love making mashed mandioca, just like you would mashed potatoes but creamier and all around better! Obrigada, viu? 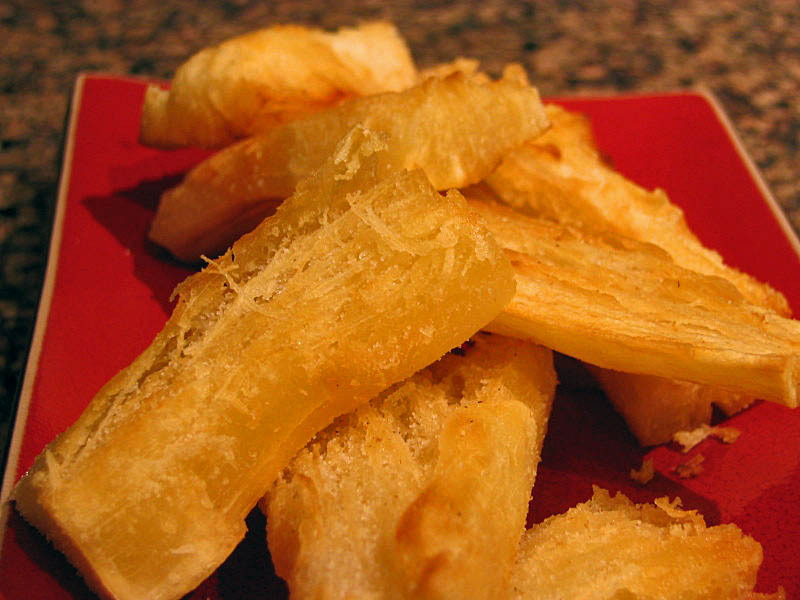 I’ve been making fried yucca for the past two years -not knowing that it was such a delicacy in Brazil. 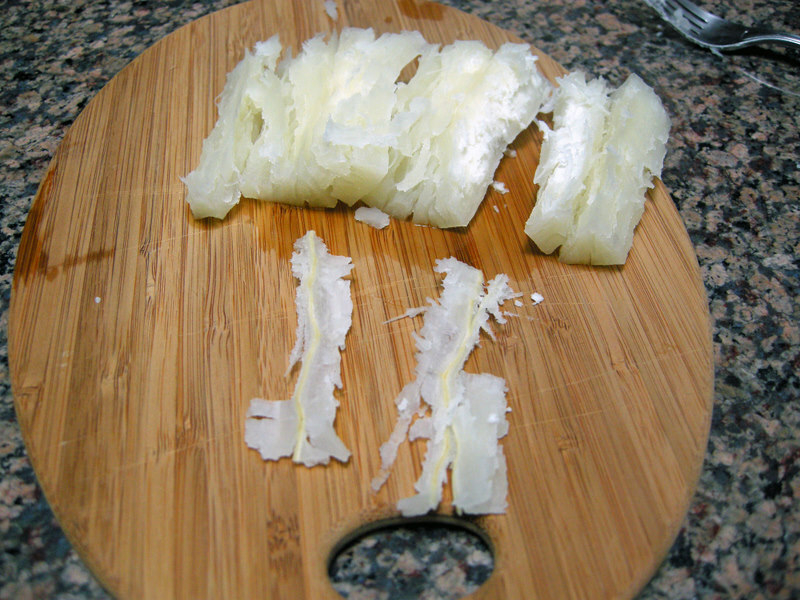 I’ve been slicing ours in to thin circles and frying in coconut oil, but I’ll try it this way the next time. Is it okay to cook them in coconut oil? I love the extra little coconut flavor, and have found it gives a pretty clean fry without being overly greasy, but I would like to try it as authentically as possible at least once. Also – I live in a house with people who are not big fans of eating things “dry” is there a dipping sauce you can recommend? (I’m sorry if that’s a horrible question … I know some things are meant to be enjoyed ‘as is’) Thank you!